The Indian Railways’ water relief operation in the drought-hit Latur district of Maharasthra has proved to be one of the largest relief measures in recent years. Officials said it was a tough challenge as the pipeline passed beneath the railway tracks and highways and the work had to be completed without obstructing any vehicular or rail movement. The pipeline from Krishna River transported water to Miraj station, where wagons of the water train were filled. According to railway officials, the water train from Miraj to Latur is the first in India to have covered a distance of 342 kms. As railways took up the challenge of supplying water in parched areas of Marathwada region, it also curtailed water supply in its own residential colonies surrounding the Miraj station in Sangli district. “Miraj station under Pune division of Central Railway was chosen as the starting point of transporting water because Krishna River has plenty of water and flows closest to the railway station. "Required infrastructure for transporting water was laid down with the help of local administration,” Indian Railways spokesperson Anil Saxena said. Pune’s Divisional Railway Manager, Bakhtiar K Dadabhoy, who supervised the operation, said up to 50 per cent water supply had to be slashed in railway colonies and in railway yards for washing of trains. He said loading of water trains was another challenge as it involved rescheduling of passenger trains to facilitate the loading of wagons from platform no 2 of Miraj station. “Railways have the capacity to pump 16 lakh litres of water per day, which is used for the washing of trains and meeting household requirements of railway colonies. The water supply in these areas had to be curtailed to develop additional capacity to load 25 lakh litres of water in wagons at Miraj so as to dispatch one rake of 50 tank wagons daily,” Dadabhoy told Mail Today. Officials said the jack-well of railways located by the banks of Krishna River was used with the 300mm pipeline running along a length of 3.5 km (approximately). Additional machinery were installed to pump water from the jackwell to be stored in the Hyder well with a capacity of 32 lakh litre. Since the Hyder well had not been used of late by railways, thorough cleaning of the well was done. It took nearly 14 hours to fill the entire train comprising 50-tank wagons, carrying 25 lakh litres of water. 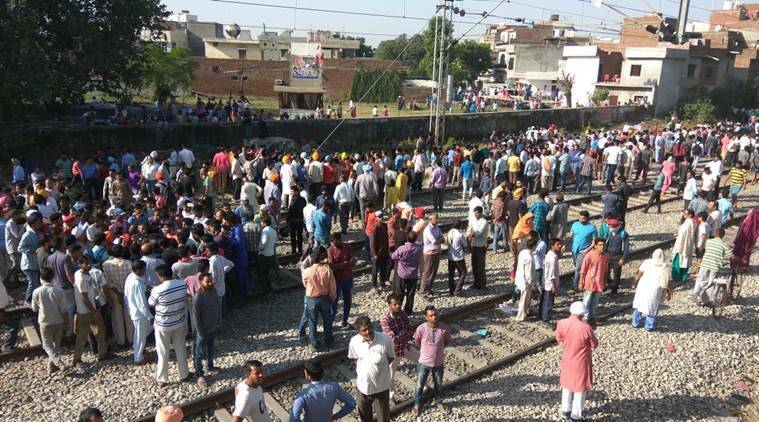 A senior rail ministry official said the wagons used for carrying water were transported from the Kota workshop in Rajasthan. A total of 100 tankers were identified for this purpose. Since these wagons were used to transporting petroleum, crude and vegetable oil, it required technical expertise to clean these wagons and make them fit for carrying potable water. The water carrying capacity is 54,000 litres per wagon, but usually it can bear 50,000 litres of water. The chief works manager of the Kota Workshop took up the challenge to prepare these wagons in a record short time. The work included steam cleaning, sludge removal, de-scaling, de-greasing and then a final cleaning of the wagons to make them fit for transportation of drinking water. The wagons carrying vegetable oil develop thick layers of sludge inside and outside. In the first stage, wagons were steam cleaned for 12 hours for removing loose sludge, following which all the valves and pipe fittings were removed for cleaning, inspection and overhauling. In the second stage, the remaining sludge had to be removed by steel scrapers manually, followed by a second round of scrapping. In the third stage, kerosene oil had to be applied by hand brush and left for half an hour to dissolve the fine layer of sludge and rust that usually remains after final scraping. The wagons were then chemically treated for an hour to dissolve remaining grease and rust. In the final round, high pressure water jet was used to get a thorough and spotless cleaning. Water put in the wagons was then drained and tested for TDS and oil and chemical contents and cleaning was declared complete only after a laboratory test declared the water fit.